An American by birth, Henry Joseph Adam spoke French until he started school.1 He was born in Indian Orchard, Hampden County, Massachusetts, on 5 August 1881, the son of Timothy and Odile (Millette) Adam, both of French Canadian heritage.2 His father had been born in Quebec, while his mother had been born in upstate New York.3 Regardless of their nationality, their roots ran deep, and the French language likely remained more familiar to them than English. Henry Joseph Adam, Sioux City, Woodbury County, Iowa, ca. 1886-87; digital image 2013, privately held by Melanie Frick, 2014. 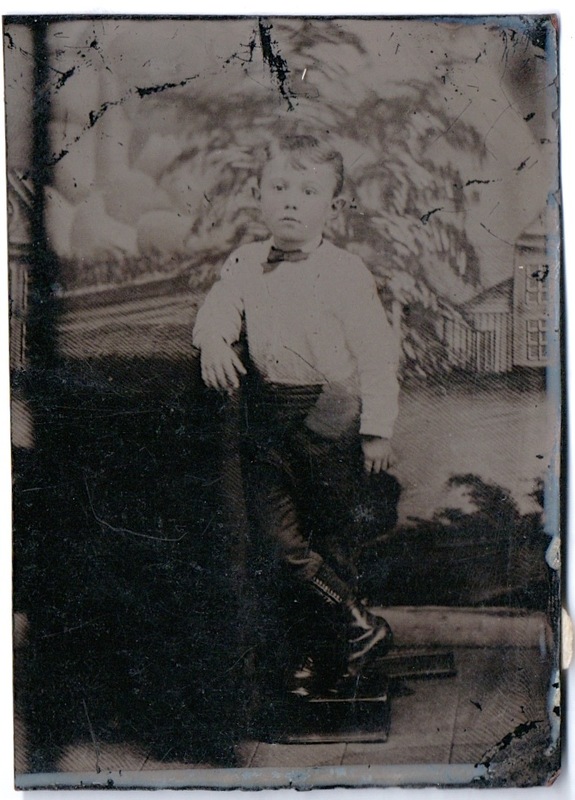 Pictured here circa 1886-87, when he was about five years old, Henry is simply but neatly dressed. He wears breeches with high patterned stockings, and a white or light-colored shirt with a contrasting bow-tie. His boots, perhaps hand-me-downs from an older brother, have been polished till they shine. He may hold a cap in his left hand, although it is indistinct due to the quality of this tintype. Despite the fact that cabinet cards grew in popularity during this decade, tintypes were still certainly not unusual. The faintest blush of pink is visible on Henry’s cheeks from a painted accent. The studio setup is interesting and not particularly professional. Henry stands upon a small stool, and leans against a piece of furniture covered with heavy fabric. The painted backdrop behind him depicts a scene of a house, fields, and a tree, which doesn’t tie in well with the wood floor in the foreground. I suspect that this photograph may have been taken in Sioux City, Woodbury County, Iowa; the Adam family moved here sometime in the mid-1880s, perhaps because of its proximity to the large French Canadian community in nearby Jefferson, Union County, South Dakota.4 Thus, this little French boy remained in good company; he may have learned English at school, but he would not have forgotten his French! 1 Gerald and Fern (Thoma) Adam, conversation with Brian Adam, ca. 1984; notes in author’s files. Gerald Adam was the son of Henry Joseph Adam. 2 “Massachusetts, Birth Records, 1840-1915,” database and images, Ancestry.com (http://www.ancestry.com : accessed 13 April 2014), entry for Henry J. Adams, 5 August 1881, Indian Orchard; citing Massachusetts Vital Records, New England Historical and Genealogical Society, Boston. 3 “Massachusetts, Marriages, 1841-1915,” digital image, FamilySearch (https://familysearch.org : accessed 13 April 2014), Timothy Adams and Julia Mellett, 22 September 1867, Springfield. Odile Millette used the name Julia early in her life. 4 1900 U.S. census, Woodbury County, Iowa, population schedule, Sioux City, enumeration district (ED) 170, sheet 15-B, p. 77 (stamped), dwelling 291, family 333, Timothy Adam; digital image, Ancestry.com (http://www.ancestry.com : accessed 13 April 2014), citing National Archives microfilm publication T623, roll 467. Henry Adam was born August 1881 in Massachusetts; his brother Theodore Adam was born June 1885 in South Dakota, and his sister Permelia Adam was born June 1887 in Iowa. This entry was posted in Photograph Analysis and tagged Adam, family history, genealogy, Iowa, Massachusetts, Millette, Sioux City, tintype on April 14, 2014 by Melanie Frick.